Ho-ho-ho Survivors! Congratulations on the upcoming Christmas and the New Year of 2048! We wish you happiness, luck, love and energy, and let the ice miss your wheels! 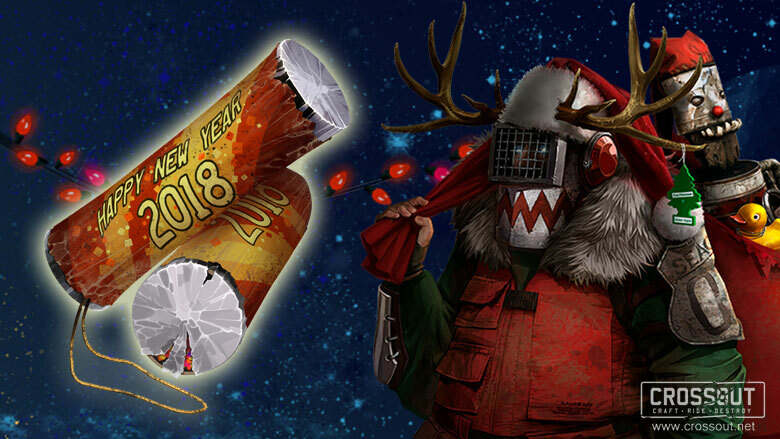 The New Year comes to Crossout! And with it, the Snowstorm. Take part in festive missions and get special Crackers! This time Scavengers brought fireworks and stickers. Scar Santa is ready to exchange valuable (to him) Crackers for special New Year decor, stickers and fireworks! Attention! The event will end on January 6 at 0:00 GMT. The scoundrel Gronch hates holidays. He stole a pack of gifts and a Christmas tree to solemnly destroy it. Your task is to get into his den, save the tree, return the presents and teach Gronch a lesson. With the beginning of the brawl Survivors need to get to the gate in the lair of the evil Gronch, fighting off his arrogant minions. The henchmen of Gronch will try to destroy the stolen Christmas tree, which you need to protect by any means! Survivors must find stolen gifts and return them to the point of evacuation. Gronch will not tolerate such a brash intrusion!Evacuate enough gifts and get ready to face the Christmas kidnapper face to face! Attention! ‘Christmas Heist’ is a PvE brawl where players battle with raiders. Added a new temporary resource — Crackers. Created in the distant 2017 for the celebration of the New Year. They have long lost the ability to explode, but some benefit from them can be extracted until the Snowstorm is over. Crackers can be sold and bought on the in-game market. A new mission New Year Fever appears in the game during the event ‘Snowstorm’”. For the victory in this mode you will get 5 Crackers. In case of defeat — 1 Cracker. Also during the event there is an additional daily task ‘Searching for Crackers’. For 2 victories in the brawl ‘Christmas Heist’ you will get 500 Crackers. At the end of the in-game event, all unused Crackers will be removed without exchange for resources. In exchange for Crackers, you can get a festive container from the Scar Santa with unique decorative parts. You can also exchange Crackers for working fireworks! Added a new temporary workbench ‘Lost and found explosives’. At this workbench you can exchange Crackers (1500 pts. ), scrap metal (500 pts.) and copper (50 pts.) for a special Gift Container.Contains New Year's decorations, dyes and stickers. Also, the workbench will exchange scrap metal, copper and Crackers for festive fireworks. Fireworks are a temporary decoration.Valid period: 7 days. The countdown will begin when you first install it on a car. Only one firework can be installed on the armored car. Can be obtained at the workbench in exchange for: 200 pts. of scrap metal, 10 pts. of copper and 400 Crackers. Launches a festive rocket filled with unrestrained joy. Can be obtained at the workbench in exchange for: 300 pts. of scrap metal, 20 pts. of copper and 600 Crackers. Launches a volley of 3 festive rockets filled with unrestrained joy. Increases post-battle reputation gain by 3%. Can be obtained at the workbench in exchange for: 400 pts. of scrap metal, 40 pts. of copper and 800 Crackers. 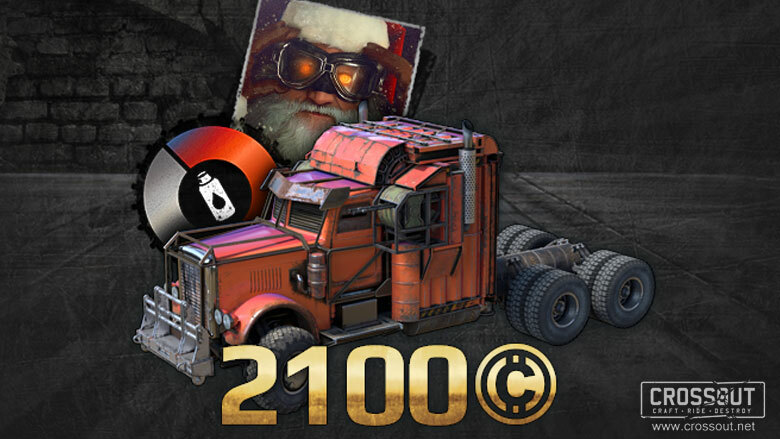 Launches a volley of 6 festive rockets into the sky, the last one in the form of the Crossout logo. Increases post-battle reputation gain by 4%. The horn of a mythical creature that drinks petrol and roars at night, scaring the children. Increases post-battle reputation gain by 2%. The nose of a mythical creature that drinks petrol and roars at night, scaring the children. Craftsmen of the new world understand the beautiful. Or the ugly, depending on your outlook. A miraculously preserved working neon sign, detached from the stand of a roadside motel. The snow used to be whiter, and the father used to be kinder.But everything changes when the apocalypse comes! Another example of post-apocalyptic folk art. Once upon a time, a lot of vans, adorned with such cones, traveled around the cities.Where are they now? Increases post-battle reputation gain by 5%. 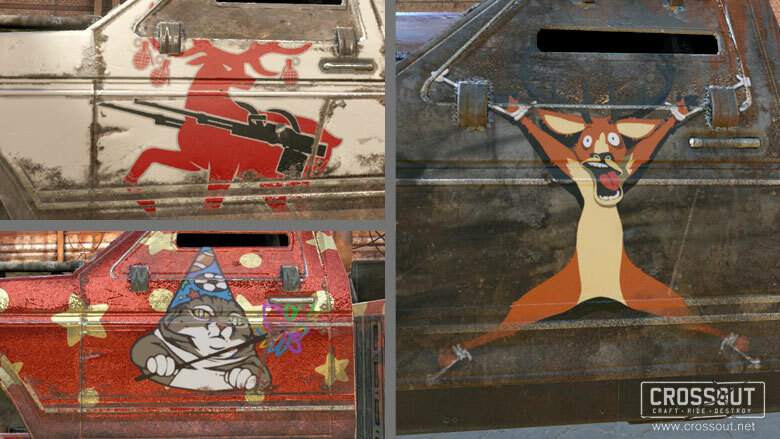 With New Year's update stickers come to Crossout. 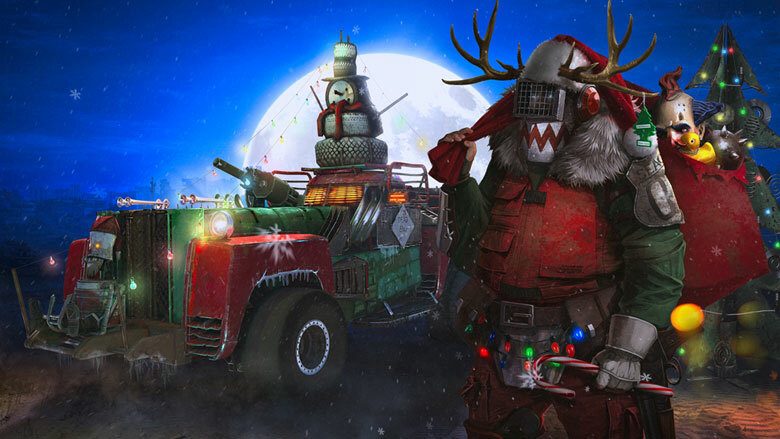 Show your creativity and make your armored car reflect your festive mood! Use stickers to decorate the armored car, changing the size and angle of rotation at will. You can not put more than two stickers on a car. Stickers are not tied to welding points. Stickers can be used together with paints.When they are used at the same time, the sticker is always applied over the paint. When applied on top of each other, the last sticker will overlap the first. Stickers can be sold and bought on the market. To experienced survivors — a beautiful New Year's garage! Our engineers decorated the hangar for the winter holidays. In the hangar, they installed a Christmas tree and snowmen from old tyres. Cozy, warm, festive! Heavy cabin.Gives 11 energy pts. Unique feature: ‘Damage for weapons with limited rotation angles is increased by 10%’. Power consumption - 3 pts. Jack is one of the last representatives of the Frost sect — a small closed commune, that held its cold rituals even before the disaster. A few years ago, the sect ceased to exist — one of its own could not stand the stress and burned down his native village. Nobody knows who it was, so the remaining Frost survivors are hunting each other. As if atoning for some crimes, Jack tries very hard to be kind to ordinary people and give them gifts: he may bring a severed raider head, or make a necklace from teeth. But both children and adults avoid him for some reason. So Jack has to wander the wasteland, in search of those he can make happy. These cabins used to be a key attribute in the rituals of the Frost sect. Inside, they maintained sub-zero temperatures and played loud, dramatic music. But if you throw out all that is superfluous, there is enough room for armor and additional equipment. Attention! The pack releases in Japan on December 19th. In all the other regions it will become available in PlayStation Store on December 21st. Changed conditions for all tasks (seasonal, daily, etc). Now to make sure a task's progress counts, players need to complete the minimum requirements for receiving the reward in battle. Looking for a place where you can ‘blow off steam’ and relax from the harsh and intense battles? Or do you want to stir some chaos with friends in the most unthinkable crafts? Crush, fly, spin! Just have fun, because this is a real ‘Bedlam’! The mode is indicated on the map with a knuckles-shaped icon. Maximum number of players on the map: 16. All players on the map are your enemies (even if you joined the battle as part of a group). Players can join the battle at any time and leave at any time. There are no win conditions, rewards or a PS-based matchmaking system. Therefore, unless you join as part of a group, you are in real trouble and you can expect anything. During training in close to combat conditions, the Engineers fight against battle-worn cars with remote control modules. Only the particularly ‘distinguished’ Engineers are sent to control such cars remotely as an educational measure. Perhaps, that's why they do not spare their opponents at all, while they serve their sentence in training. But after the disaster, for drivers who want to improve their skills or try out a new armored car, this is the best alternative to fighting a real opponent. ‘Practice’ is an alternative to PvP missions for players who want to hone their skills against computer opponents. Players fight in one team against a team of remotely controlled cars. From reputation levels 1 to 3 inclusive with the ‘Engineers’ faction the player participates in ‘Practice’ mode. This is a great opportunity to experiment with your first armored car and get to know other Survivors with whom you can continue your journey through the Wasteland. At the same time, before reaching level 4, the player receives the same reward as for participating in ordinary Missions. After reaching level 4, the player gets access to the missions ‘Get the machine gun!’, 'Get the shotgun!' and to the ‘Raid’ mode. At the same time, in ‘Practice’ he stops receiving parts and fuel as a reward, and the amount of reputation and scrap received in this mode is reduced. Only experienced drivers and veterans of the wasteland can join this dangerous raid. To capture and protect the tower, they will have to withstand the onslaught of three waves of raiders. At the end of each phase the fearless survivors will face a difficult battle with the leader. Leader elimination — 100 items. Survivors will have just 60 parts to restore and reprogram the destroyed Raider turrets in the heat of battle.After that, the opponents will have to suffer! Everyone is going to get hit in battle — including the reprogrammed turrets.But vigilant drivers will be able to fix them with the help of parts. The more damaged the turret, the more resources will be needed to repair it. The third turret level (160 parts) once again multiplies its structure and damage by 1.5. If at the height of the battle the turret is destroyed, it can be placed again.You are going to need as many parts as the survivors spent on its last upgrade before destruction. Thanks to the efforts of wasteland engineers, the turret retains all upgrades after its restoration. The raid will be available only on medium and hard levels of difficulty. Now the raid will be available only on medium and hard levels of difficulty. Damage of the Raiders of the Nomads faction is increased by 10%. 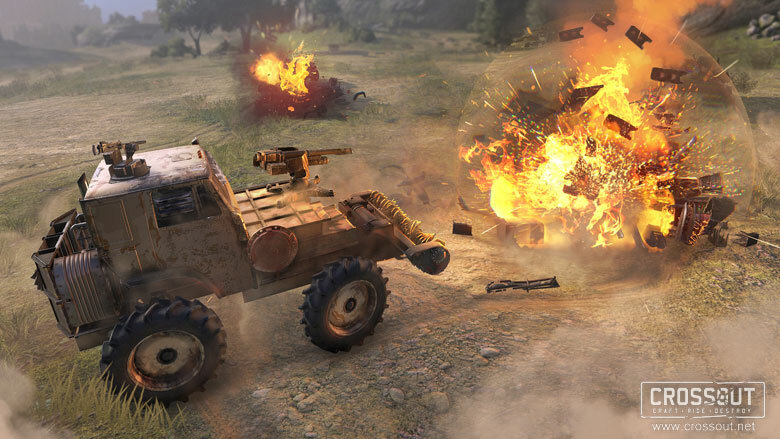 The structure of armored vehicles of the Raiders of the Nomads faction is increased by 10%. The damage of the Raiders of the Nomads faction is increased by 20%. The structure of armored vehicles of the Raiders of the Nomads faction is increased by 20%. The damage of the raiders of the factions Nomads , Lunatics and Scavengers is increased by 20%. The structure of the armored cars of the Raiders of the factions Nomads, Lunatics and Scavengers is increased by 20%. The damage of the raiders of the Lunatics faction is increased by 10%. The damage of the raiders of the factions Nomads and Scavengers is increased by 20%. The structure of the armored vehicles of the Raiders of the Lunatics fraction is increased by 10%. The structure of the armored vehicles of the Raiders of the Nomads and Scavengers fractions is increased by 20%. The damage of the raiders of the factions Nomads, Lunatics and Scavengers is increased by 20%. The minimum requirements for seasonal tasks have been changed. Seasons of medium difficulty are now available from reputation level 10 with Engineers. Hard seasons are now available from reputation level 5 with Lunatics, Nomads or Scavengers. Increased task difficulty in hard seasons. At this point in the game there is a monthly reward for participating in the scuffles. To obtain it you need to take part in a certain number of battles in the "Brawls" step by step, collect fragments of the award and exchange them for a reward. From January 1, 2018, the mechanics will be changed, and the reward will be weekly.To receive the reward, the player will need to take places from 1 to 4 in the scuffle for 9 weeks. A new award for the successful fulfillment of the conditions: "Container of the prospector". The base amount of reputation received after the scuffle, changed to 1000 points. The number of reputation points received for every second after the storm started has been changed to 5. The basic amount of scrap received from the scuffle was changed to 32 units. We strive to make Brawls and Missions equally effective ways of obtaining reputation points and resources. Brawls are fun modes — each with its own unique gameplay. This is their advantage over the usual battles. The amount of reputation required for a level-up in some factions has been revised. In the Engineers faction, the total amount of reputation needed to level the fraction from level 1 to level 30 is reduced by 20%.In this regard, we recalculated the reputation requirements from rank 14 to rank 30. Now the total amount of reputation required for levelling advanced fractions (Lunatics, Nomads, and Scavengers) from level 1 to level 15, is reduced by 10%. Changed the mechanics of calculating reputation from battles. Previously, in each mode, there was a limit for reputation gain.Points earned beyond the limit were not taken into account. Now all modes have a soft limit.Before reaching this limit, 1 point, earned in battle = 1 point of reputation. After exceeding it, all points earned above the limit are recalculated taking the coefficient into account. Now every point earned in any mode affects your final reward. After an old accident at the chemical plant, considerable areas around it became uninhabitable due to soil contamination. Only desperate brave souls and those who had nowhere to go, decided to settle in these places. But everything changed when, during one of the expeditions to the contaminated zone, scouts found a large lake with the purest water, and at the bottom of the lake they found an artifact. Such a change in the landscape caused great interest in this land among the raiders. The map will be available only in the raid ‘Heist’. Cabin power parameters are changed in proportion to their maximum mass. Developer comment: the power parameter allows the machine to not lose acceleration with increasing mass. Before, the power numbers did not exactly correspond to the tonnage that cabins had. As a result, assemblies based on light cabins could seem more powerful than heavy-duty assemblies at the same mass. Increased effectiveness of explosion impact on energy shields. This machine gun was moved to a separate type ‘Automatic weapons’. ‘Heat-resistant’ and ‘With cooling’ are no longer available. For existing parts, these upgrades were replaced by the upgrade ‘Dangerous’ (+5% to damage). Added an indication of unique weapon perks. The drone no longer reacts to opponents that are not highlighted by the owner's radar. The drone will react to the enemy if it was highlighted by an allied radar and the information was transmitted by radio or radar detector. Now the total maximum bonus to reputation, which can be obtained when installing decor is 25%. The bonus for flags is not included in this limit. Individual bonus to earned reputation is increased from 9% to 15%. Team bonus to earned reputation is increased from 3% to 10%. The flag owner receives both bonuses.Thus, he will receive 25% of bonus reputation. The changes are relevant for parts: ‘Engineer Flag’, ‘Lunatic Flag’, ‘Nomad Flag’, ‘Scavenger Flag’, ‘Steppenwolf Flag’, ‘Dawn's Children Flag’. Previously there were two speed parameters in cabin description. Now it is one parameter - ‘Maximum speed’. Added a number of interface sounds. Added the ability to adjust lot parameters on the Market. Now, when you're missing any components, there is an option to go directly to the Market. Now when someone who is not the group leader presses the button ‘To garage’, a warning is displayed that he will leave the group. Empty slots for daily tasks are no longer displayed. Now ‘Stickers’, received for certain actions in combat, are called ‘Patches’. Now the colors and stickers are in the warehouse section ‘Customization’. Added animation for getting a co-driver level. Now the parts installed on the car are displayed in the Warehouse in a separate slot. Added the ability to go to the parts production window from the Market. The display of the parameters of hovers in the interface has been improved. Changed icons of categories of items on the Warehouse. Improved drone behaviour on a number of maps. Improved visual effects for water. Improved visual display of the battle start process. Improved visual effects on maps, in combat, in collisions. Improved hit effects for guns in order to improve aiming. Models of a number of parts have been modified. Added a sound effect of dropping ammunition in raids. Fixed a bug with different behaviour of some weapons in test drive and in combat. After changing the system of explosions, players received an incorrect idea of the magnitude of some bonuses when upgrading the modules.This was applicable to bonuses that affect the reduction in strength and radius of the explosion. Players are now shown the correct values. Fixed animation for hover turns with an active hand brake. Fixed a bug with the description of the number of Engineer blueprints. Fixed a number of errors, typos in texts. Fixed the sound of braking for Lunar IV wheels. Fixed a number of minor interface bugs. Fixed errors on several maps. Fixed a bug with Caucasus blocking when clicking on the ‘Free Camera’ button. Fixed a bug in the audibility of car horns in spectator mode. Fixed a bug with surface grip. Fixed a bug with accounting for the distance traveled on hovers. Modified physical models of a number of parts. Fixed a bug where successively taking off drones could interfere with each other. Fixed a bug where the car appeared above an ally machine. Fixed a bug with explosions of large objects, towers in raids. Fixed a bug with exceeding physical impulse wave above the explosion radius. Fixed a camera reset error during a guided flight of a TOW missile. This patchnote reveals all the key in-game changes and may not include all the fixes. Changes, that are aimed at improvement of Crossout, appear constantly and may not require their own patch. Reward in the form of scrap metal was cancelled in this brawl. Fixed a bug with the rewards in Brawls mode - now the special rewards are issued correctly.